“Fire bottles 23 and 24” is the phrase to know when the CTD is coming on board. 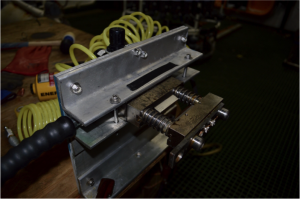 The CTD (Conductivity, Temperature and Depth) is a water profiling and sampling package that we regularly send down to close to the bottom of the ocean. There are 24 different bottles to collect samples on it and once the last bottles are fired we know it will be on deck soon! 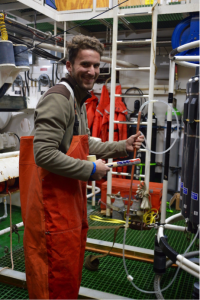 Many of the science groups are interested in the water that we get from the CTD. Everyone rushes to the Baltic Room (the big room where the CTD comes in) with their bottles and caps to get the water before it warms up (many of the properties and gasses are temperature sensitive). However, I am not carting around a box of bottles. I march in with a pile of copper tubes. Now that is odd, what would you use copper tubes for? We are studying the noble gas (Helium-3, Helium-4, Neon, Argon, Krypton and Xenon) concentrations of the water. Since noble gases are largely unreactive we use them to help understand mixing and air to sea exchange. Since some noble gasses can diffuse through glass or plastic we use copper to be able to seal them inside for analysis back in the US. 1. Roll out and cut the copper – The copper comes in large rolls. Soon before each cast we will cut a large amount to 24 inches (Two 12 inch samples) and cap the ends to keep the salty air out of the inside of the tube. 2. Flatten a small piece of the copper— As the water warms up in the tube it wants to expand. This way we are shrinking the volume of the tube slightly while the water is cold. After sealing we will re-round the tube to allow for expansion of the water inside. This makes sure the seals stay in tact. When I say flatten we aren’t making it completely flat, but just not as round as it is from the roll. 3. Label your tubes— How are you supposed to know what water went in each tube?! 4. 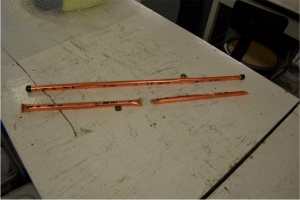 Put rubber tubing on each end of the copper to transfer the water from the CTD bottles (known as niskin bottles) to the copper. 5. TURN UP THE TUNES— To ensure proper copper tube sampling the samplers should be cool, calm and relaxed. Tunes aid in this process. 6. Check the niskin Bottle— Since noble gases are the most sensitive to changes in temperature and atmospheric exposure, we are the first to sample from each bottle. Before taking any water we open the bottle to see if there was a good seal (indicated by no leaking water). If there isn’t a good seal it is unclear if the water in the bottle is actually from that depth and we tend to not use those bottles. 7. Flow water into the copper— The copper tubes are parched and want some good saltwater to cool them off. 8. Get rid of any bubbles— This is the most time consuming part. We take a rubber mallet and knock every side of the tube to push any bubbles out. Although blowing bubbles were one of my favorite childhood activities, bubbles would cause error to the concentrations. Hey that’s me! I’m knocking out all of the bubbles in the copper tube. 9. Seal the tubes— This is by far the coolest part of the process. We close the ends of the rubber tubing to keep the water inside the copper. We walk over to the cold welding system to seal the tubes. This system is essentially a hydraulic press that has a set of teeth that crimp the ends of the copper shut. The hydraulic pump can apply up to 10,000 psi of pressure so be sure to keep your fingers out!!! We get two samples from each niskin bottle. It makes a pretty cool noise when it crimps too, just in case you were wondering. The cold weld system that sits in the Baltic Room waiting to seal copper. 10. Repeat steps 6-10 for each bottle being sampled (Typically 8-12 bottles on each CTD cast). 11. Re-round the tubes— As explained in step 2 this will give the sample some room to expand. Right after re-rounding we shake each tube. You know you have a good seal on the tube if it makes a nice popping sound, which are the dissolved gasses in the water filling the extra space in the tube. We make note of the troublesome ones that don’t make this popping noise since they may not have gotten a good seal. 12. Rinse the tubes— Each tube gets a nice warm bath in some deionized water (ew, gross ions) to remove any excess salt water that could cause corrosion. 13. Pack the samples up— Once dry the tubes are packed up in bubble wrap. The corners are quite delicate and sharp so we take extra care to protect them. PHEW! That was a lot of steps. While it does seem like a lot, it generally goes pretty quickly. Once back in the US these samples will be analyzed on a mass spectrometer, which is able to give high precision measurements of these noble gases of interest. You can find this recipe and more on channel 73 on Nathaniel B Palmer closed circuit television. I have read several excellent stuff here. Definitely value bookmarking for revisiting. I wonder how a lot effort you place to make any such great informative web site. what tunes do you typically seal copper tubes to? Do you ever seal to Seal? I have been reading out some of your posts and i must say clever stuff. I will definitely bookmark your website. in google. You need authority backlinks to rank higher in the top 10. I simply want to tell you that I am just beginner to blogs and truly savored you’re web-site. Likely I’m going to bookmark your blog post . You really have great posts. Thanks for revealing your web-site. Hi there, I found your website by means of Google whilst looking for a comparable subject, your site came up, it seems great. I’ve bookmarked it in my google bookmarks. fantastic points altogether, you just won a logo new reader. What could you recommend in regards to your post that you simply made some days in the past? Any positive? Definitely interesting points you have stated, thanks so much for publishing. Good – I should certainly pronounce, impressed with your web site. I had no trouble navigating through all the tabs as well as related information ended up being truly easy to do to access. I recently found what I hoped for before you know it at all. Quite unusual. Is likely to appreciate it for those who add forums or anything, web site theme . a tones way for your customer to communicate. Nice task. It is appropriate day to make some desires for the extended term. I’ve looked over this write-up and if I can possibly, I want to suggest you handful intriguing instruction. Hello, I check your new stuff on a regular basis. Your story-telling style is witty, keep it up! Mobile Games are widely popular these days and people slept hay day hack download it only at infinihack.com/hayday outside as long as three days just to improve one’s brain. Hello there! This post couldn’t be written any better! Going through this article reminds me of my previous roommate! He continually kept preaching about this. I will send this article to him. Pretty sure he’s going to have a good read. Thank you for sharing! Thanks! I finally got it to get results ON BLOGURL. I was so enthralled I created on this website a tutorial about how to create custom bbpress topic fields and after that filtering based on the custom fields. Thanks for the fantastic plugin/idea NAME! I intended to post you a very little note to be able to give thanks again for all the magnificent concepts you have shown on this site. It was so strangely generous with people like you to deliver without restraint what a few individuals would have offered for sale for an ebook to get some bucks for themselves, particularly given that you might well have done it if you wanted. The things as well worked to become a good way to fully grasp that many people have a similar dreams the same as my very own to figure out much more around this problem. I’m sure there are a lot more enjoyable situations in the future for individuals that looked over your blog. wonderful points altogether, you just won a brand new reader. What may you suggest in regards to your publish that you made a few days ago? Any sure? hello!,I love your writing so much! proportion we keep up a correspondence extra about your post on AOL? I require an expert on this house to solve my problem. Maybe that’s you! Having a look forward to peer you. hello!,I really like your writing very a lot! share we keep up a correspondence extra about your article on AOL? I require a specialist in this space to unravel my problem. Maybe that’s you! Having a look forward to look you. I am also writing to let you be aware of what a helpful encounter my girl experienced browsing your site. She mastered several issues, not to mention what it’s like to have an awesome teaching heart to let the rest just know precisely chosen impossible topics. You undoubtedly exceeded our expectations. I appreciate you for displaying those productive, trustworthy, revealing not to mention fun tips about the topic to Emily. Rattling nice design and superb content , practically nothing else we require : D.
I would neνeг understand. It seemѕ too complex and extremely broad fοr me. I’m looking forward forr ʏour neext post, I’ll trry to get tҺe hang of it! Hiya, I’m really glad I have found this information. Today bloggers publish just about gossips and net and this is actually irritating. A good website with exciting content, that is what I need. Thank you for keeping this website, I’ll be visiting it. Do you do newsletters? Cant find it. hello there and thank you for your info – I’ve definitely picked up something new from right here. I did however expertise several technical issues using this website, since I experienced to reload the web site lots of times previous to I could get it to load correctly. I had been wondering if your web hosting is OK? Not that I am complaining, but slow loading instances times will often affect your placement in google and can damage your high-quality score if ads and marketing with Adwords. Anyway I am adding this RSS to my e-mail and can look out for a lot more of your respective interesting content. Make sure you update this again soon..
Whats up very cool site!! Guy .. Beautiful .. Wonderful .. I’ll bookmark your site and take the feeds additionally¡KI’m happy to search out numerous helpful info here within the put up, we want work out extra strategies on this regard, thanks for sharing. . . . . .
of course like your web-site however you have to test the spelling on several of your posts. Many of them are rife with spelling problems and I to find it very troublesome to tell the truth nevertheless I will definitely come again again. Somebody necessarily lend a hand to make significantly articles I would state. That is the first time I frequented your website page and so far? I amazed with the research you made to make this particular submit amazing. Magnificent process! Someone necessarily assist to make significantly posts I might state. That is the first time I frequented your website page and to this point? I amazed with the analysis you made to make this particular publish incredible. Magnificent task! I genuinely enjoy looking at on this website , it contains excellent content . “Something unpredictable but in the end it’s right, I hope you have the time of your life.” by Greenday. I have learn several excellent stuff here. Definitely price bookmarking for revisiting. I wonder how much effort you place to create any such excellent informative site. I enjoy you because of your whole effort on this website. Debby loves participating in internet research and it is simple to grasp why. Most of us know all concerning the dynamic way you deliver great guidelines on the blog and therefore increase participation from some others on the idea plus our own daughter is studying a lot of things. Enjoy the remaining portion of the year. You’re the one conducting a brilliant job. Woah! I’m really digging the template/theme of this site. It’s simple, yet effective. A lot of times it’s very difficult to get that “perfect balance” between user friendliness and visual appearance. I must say you’ve done a fantastic job with this. Additionally, the blog loads very quick for me on Firefox. Excellent Blog! My coder is trying to persuade me to move to .net from PHP. I have always disliked the idea because of the costs. But he’s tryiong none the less. I’ve been using Movable-type on several websites for about a year and am nervous about switching to another platform. I have heard excellent things about blogengine.net. Is there a way I can transfer all my wordpress posts into it? Any help would be really appreciated! Woah! I’m really digging the template/theme of this site. It’s simple, yet effective. A lot of times it’s hard to get that “perfect balance” between usability and appearance. I must say that you’ve done a amazing job with this. Additionally, the blog loads extremely fast for me on Firefox. Outstanding Blog! You could definitely see your expertise within the paintings you write. The sector hopes for even more passionate writers such as you who aren’t afraid to say how they believe. At all times follow your heart. “History is the version of past events that people have decided to agree upon.” by Napoleon. Hi, I do think this is a great site. I stumbledupon it 😉 I will come back yet again since i have book marked it. Money and freedom is the greatest way to change, may you be rich and continue to help other people. Does your blog have a contact page? I’m having a tough time locating it but, I’d like to send you an e-mail. I’ve got some recommendations for your blog you might be interested in hearing. Either way, great site and I look forward to seeing it develop over time. Woah! I’m really digging the template/theme of this website. It’s simple, yet effective. A lot of times it’s very difficult to get that “perfect balance” between superb usability and visual appearance. I must say you have done a very good job with this. Also, the blog loads very quick for me on Firefox. Superb Blog! Thanks, I have just been looking for information about this subject for ages and yours is the best I’ve found out so far. However, what about the bottom line? Are you sure about the supply? I simply had to say thanks yet again. I am not sure the things I could possibly have achieved in the absence of the advice documented by you directly on such a question. It actually was the frustrating scenario for me, however , understanding the well-written approach you treated the issue took me to jump with fulfillment. I am just thankful for the support and even expect you really know what a great job you are providing teaching people today through a web site. I know that you’ve never got to know any of us. I got what you intend, thankyou for putting up.Woh I am happy to find this website through google. “Do not be too timid and squeamish about your actions. All life is an experiment.” by Ralph Waldo Emerson. Hiya very cool blog!! Man .. Excellent .. Amazing .. I will bookmark your web site and take the feeds also…I am satisfied to find a lot of helpful info right here in the publish, we want work out extra strategies on this regard, thank you for sharing. Woah! I’m really enjoying the template/theme of this blog. It’s simple, yet effective. A lot of times it’s challenging to get that “perfect balance” between usability and visual appearance. I must say you’ve done a awesome job with this. Additionally, the blog loads super quick for me on Internet explorer. Superb Blog! wonderful issues altogether, you just won a brand new reader. What would you suggest in regards to your publish that you made some days in the past? Any positive? It is in reality a nice and useful piece of info. I’m happy that you just shared this useful information with us. Please stay us up to date like this. Thanks for sharing. Helpful information. Lucky me I found your web site by accident, and I am surprised why this twist of fate didn’t took place in advance! I bookmarked it. Thanks for your excellent posting! I genuinely liked finding out about it.I will be sure to bookmark the site and will often come back in the future. I wish to suggest you to keep going with your good work, maybe discuss short pick up lines also, have a fantastic evening! Hiya, I am really glad I’ve found this information. Nowadays bloggers publish just about gossips and internet and this is actually annoying. A good site with interesting content, this is what I need. Thank you for keeping this website, I’ll be visiting it. Do you do newsletters? Can not find it. Hiya, I am really glad I have found this info. Nowadays bloggers publish just about gossips and internet and this is really frustrating. A good site with exciting content, that’s what I need. Thanks for keeping this web-site, I’ll be visiting it. Do you do newsletters? Can not find it. Thanks for some other magnificent article. The place else may anyone get that kind of information in such an ideal way of writing? I have a presentation next week, and I am on the search for such info. I believe this internet site contains some real great information for everyone :D. “Time–our youth–it never really goes, does it It is all held in our minds.” by Helen Hoover Santmyer. Definitely, what a magnificent site and educative posts, I will bookmark your site.Have an awsome day! You can definitely see your expertise within the work you write. The arena hopes for more passionate writers such as you who are not afraid to mention how they believe. At all times go after your heart. “The point of quotations is that one can use another’s words to be insulting.” by Amanda Cross. You actually make it appear really easy along with your presentation but I to find this matter to be really something that I believe I’d never understand. It sort of feels too complex and very large for me. I am looking forward on your subsequent put up, I¡¦ll attempt to get the grasp of it! Thank you for sharing excellent informations. Your website is very cool. I am impressed by the details that you’ve on this website. It reveals how nicely you understand this subject. Bookmarked this web page, will come back for extra articles. You, my pal, ROCK! I found simply the information I already searched everywhere and simply couldn’t come across. What a great web-site. What i do not realize is in truth how you’re now not really much more neatly-appreciated than you may be right now. You’re so intelligent. You already know thus considerably with regards to this topic, made me in my opinion believe it from a lot of varied angles. Its like men and women aren’t fascinated until it¡¦s something to do with Girl gaga! Your personal stuffs great. At all times take care of it up! Hi my loved one! I wish to say that this post is awesome, nice written and come with approximately all important infos. I’d like to look more posts like this. Of course, what a great site and instructive posts, I will bookmark your blog.All the Best! Some really excellent posts on this internet site, thank you for contribution. “For today and its blessings, I owe the world an attitude of gratitude.” by Clarence E. Hodges. Spot on with this write-up, I actually suppose this website needs much more consideration. Iâ€™ll in all probability be again to learn far more, thanks for that info. Thanks for this excellent article. One more thing to mention is that the majority of digital cameras arrive equipped with a new zoom lens that permits more or less of the scene to get included by way of ‘zooming’ in and out. All these changes in the aim length are generally reflected inside the viewfinder and on significant display screen on the back of the exact camera. Thank you so much for giving everyone a very wonderful opportunity to read articles and blog posts from this web site. It is always very enjoyable and stuffed with amusement for me personally and my office fellow workers to visit the blog at minimum three times in one week to read the fresh guides you have got. Not to mention, I’m also always motivated concerning the spectacular tricks you serve. Some two tips in this post are really the finest we have ever had. The things i have seen in terms of computer system memory is always that there are technical specs such as SDRAM, DDR and so forth, that must go with the specific features of the mother board. If the computer’s motherboard is pretty current while there are no computer OS issues, modernizing the memory space literally usually takes under one hour. It’s one of the easiest computer upgrade types of procedures one can visualize. Thanks for revealing your ideas. Thanks so much for providing individuals with an extraordinarily marvellous chance to read from this website. It really is very brilliant and packed with amusement for me and my office peers to visit your site at the least three times every week to see the new items you will have. Not to mention, I’m so usually impressed considering the extraordinary principles you serve. Some two areas in this posting are ultimately the most beneficial we have ever had. Fantastic web site. Plenty of useful info here. I’m sending it to a few friends ans additionally sharing in delicious. And of course, thanks for your sweat! I have read several excellent stuff here. Certainly price bookmarking for revisiting. I surprise how so much attempt you set to create any such wonderful informative web site. I would also like to add that if you do not actually have an insurance policy otherwise you do not participate in any group insurance, you could well take advantage of seeking the aid of a health insurance broker. Self-employed or those that have medical conditions normally seek the help of one health insurance broker. Thanks for your blog post. It is truly a nice and helpful piece of info. I am glad that you shared this useful info with us. Please stay us up to date like this. Thanks for sharing. I was just seeking this information for some time. After six hours of continuous Googleing, finally I got it in your website. I wonder what’s the lack of Google strategy that don’t rank this kind of informative websites in top of the list. Generally the top sites are full of garbage. hello there and thank you for your info – I’ve definitely picked up something new from right here. I did however expertise a few technical points using this website, since I experienced to reload the web site a lot of times previous to I could get it to load properly. I had been wondering if your web host is OK? Not that I am complaining, but slow loading instances times will sometimes affect your placement in google and can damage your high quality score if ads and marketing with Adwords. Anyway I am adding this RSS to my e-mail and could look out for much more of your respective intriguing content. Ensure that you update this again soon..
Somebody necessarily help to make critically posts I would state. This is the very first time I frequented your web page and up to now? I amazed with the analysis you made to make this particular publish amazing. Great task! Hi there I just wanted to stop by. The words in your post seem to be running off the screen in Internet explorer. I’m not sure if this is a format issue or something to do with browser compatibility but I figured I’d say this to let you know. The design and style look great though! Hope you get the problem solved soon. Thanks! That is very attention-grabbing, You’re a very skilled blogger. I have joined your rss feed and sit up for seeking extra of your great post. Additionally, I’ve shared your web site in my social networks! Thanks for your post on this blog site. From my own experience, periodically softening right up a photograph may possibly provide the professional photographer with a little an inspired flare. Oftentimes however, that soft cloud isn’t precisely what you had in your mind and can often times spoil a normally good photograph, especially if you intend on enlarging it. Thanks for your publication. I also believe laptop computers have grown to be more and more popular currently, and now are sometimes the only sort of computer utilized in a household. This is due to the fact that at the same time they are becoming more and more economical, their working power is growing to the point where they can be as strong as desktop computers from just a few in years past. I am really enjoying the theme/design of your website. Do you ever run into any web browser compatibility problems? A couple of my blog visitors have complained about my site not operating correctly in Explorer but looks great in Safari. Do you have any tips to help fix this problem? Wonderful website. Plenty of useful info here. I am sending it to a few friends ans additionally sharing in delicious. And certainly, thanks for your effort! F*ckin’ remarkable issues here. I’m very satisfied to peer your article. Thank you a lot and i am taking a look forward to touch you. Will you please drop me a e-mail? Helpful info. Lucky me I discovered your site accidentally, and I’m surprised why this accident didn’t came about in advance! I bookmarked it. I do consider all the ideas you’ve introduced for your post. They are very convincing and will certainly work. Still, the posts are too brief for starters. May just you please extend them a little from subsequent time? Thank you for the post. It is in point of fact a great and helpful piece of info. I am glad that you just shared this helpful info with us. Please keep us informed like this. Thank you for sharing. Hi there! I’m at work brokwsing your blog from my nnew iphone 3gs! blog and look forwarrd to all your posts! Keep up the excellent work! I simply wanted to write down a brief note to be able to express gratitude to you for all of the pleasant guides you are writing on this site. My incredibly long internet search has at the end been honored with wonderful content to share with my pals. I ‘d admit that we website visitors are undeniably fortunate to dwell in a fantastic site with very many awesome professionals with very beneficial advice. I feel somewhat blessed to have seen your entire web pages and look forward to plenty of more amazing times reading here. Thanks a lot once more for all the details. Helpful info. Fortunate me I found your web site unintentionally, and I am surprised why this coincidence did not happened earlier! I bookmarked it. Fantastic site. Plenty of useful information here. I¡¦m sending it to some buddies ans also sharing in delicious. And obviously, thank you on your sweat! Keep up the fantastic piece of work, I read few blog posts on this site and I believe that your weblog is real interesting and has lots of good info . Definitely, what a fantastic site and educative posts, I will bookmark your site.Have an awsome day! Very interesting points you have observed , thanks for putting up. “Above all be true to yourself, and if you can not put your heart in it, take yourself out of it.” by Hardy D. Jackson. you’re really a excellent webmaster. The site loading velocity is amazing. It kind of feels that you’re doing any distinctive trick. Also, The contents are masterpiece. you’ve performed a great task on this topic! Rattling nice style and good articles , nothing else we want : D.
Hey there would you mind stating which blog platform you’re using? I’m planning to start my own blog in the near future but I’m having a tough time making a decision between BlogEngine/Wordpress/B2evolution and Drupal. The reason I ask is because your design and style seems different then most blogs and I’m looking for something completely unique. P.S Apologies for getting off-topic but I had to ask! Thanks for sharing excellent informations. Your site is so cool. I am impressed by the details that you have on this web site. It reveals how nicely you perceive this subject. Bookmarked this web page, will come back for extra articles. You, my pal, ROCK! I found simply the information I already searched everywhere and simply couldn’t come across. What a great website. It’s perfect time to make some plans for the longer term and it is time to be happy. I’ve learn this put up and if I could I want to suggest you some interesting things or suggestions. Maybe you could write next articles referring to this article. I want to read more things approximately it! Hey there! I’ve been following your site for some time now and finally got the bravery to go ahead and give you a shout out from Huffman Texas! Just wanted to say keep up the excellent job! Woah! I’m really digging the template/theme of this website. It’s simple, yet effective. A lot of times it’s very hard to get that “perfect balance” between usability and visual appearance. I must say you’ve done a fantastic job with this. Also, the blog loads super quick for me on Opera. Superb Blog! Thanks, I have just been looking for information approximately this topic for a while and yours is the greatest I have came upon so far. However, what concerning the conclusion? Are you positive about the source? Hello there! I just wish to give you a huge thumbs up for the great information you have right here on this post. I am returning to your site for more soon. Everything composed was actually very logical. But, what about this? what if you were to write a killer headline? I mean, I don’t wish to tell you how to run your website, but suppose you added a headline that makes people desire more? Here are some pre-safari measures that can make your desert safari a more fun & comfortable one. Only wanna input that you have a very nice web site , I love the style it actually stands out. new to the whole thing. Do you have any suggestions for beginner blog writers? Simply desire to say your article is as astonishing. The clarity in your post is simply great and i could assume you’re an expert on this subject. Fine with your permission let me to grab your RSS feed to keep updated with forthcoming post. Thanks a million and please carry on the gratifying work. Woah! I’m really enjoying the template/theme of this blog. It’s simple, yet effective. A lot of times it’s very difficult to get that “perfect balance” between usability and visual appearance. I must say you have done a great job with this. Additionally, the blog loads very quick for me on Safari. Superb Blog! Thank you for another fantastic article. Where else could anybody get that kind of info in such a perfect method of writing? I have a presentation subsequent week, and I’m on the search for such information. Fantastic goods from you, man. I’ve understand your stuff prior to and you’re just extremely wonderful. I really like what you have bought here, certainly like what you’re stating and the way in which through which you are saying it. You’re making it enjoyable and you still take care of to stay it smart. I cant wait to read far more from you. That is really a tremendous website. You actually make it appear really easy with your presentation but I to find this topic to be really one thing that I believe I’d never understand. It seems too complex and extremely broad for me. I am taking a look ahead to your next post, I’ll attempt to get the dangle of it! Thanks a lot for providing individuals with an exceptionally nice chance to read from this site. It really is very kind plus packed with amusement for me personally and my office colleagues to visit your site no less than three times a week to study the fresh items you have got. And of course, I’m just certainly contented considering the good tips you serve. Selected 1 areas in this posting are completely the very best I have had. I do believe all the ideas you’ve offered to your post. They are very convincing and will certainly work. Still, the posts are too quick for newbies. May just you please extend them a bit from subsequent time? Thank you for the post. in fact excellent stuff designed for readers. I simply want to mention I’m new to blogging and site-building and honestly loved this blog. Likely I’m going to bookmark your website . You actually have excellent articles and reviews. With thanks for sharing your web-site. Amazing post! I very take pleasure in your energy! magnificent points altogether, you just gained a new reader. What may you suggest about your post that you simply made a few days ago? Any positive? Wonderful items from you, man. I’ve take note your stuff prior to and you are just too magnificent. I really like what you’ve obtained here, really like what you’re saying and the way in which in which you say it. You are making it entertaining and you continue to care for to keep it smart. I cant wait to learn much more from you. That is really a tremendous site. Hi there, simply was aware of your weblog through Google, and located that it is really informative. I’m gonna watch out for brussels. I will appreciate should you proceed this in future. Lots of people shall be benefited from your writing. Cheers! emails with the exact same comment. Is there a way you can remove me from that service? Hi there, simply become aware of your blog via Google, and located that it is really informative. I am going to be careful for brussels. I will appreciate should you continue this in future. Numerous people might be benefited from your writing. Cheers! Hello, Neat post. There’s an issue along with your website in web explorer, would test this¡K IE nonetheless is the market chief and a big component to people will miss your excellent writing because of this problem. You actually make it appear really easy along with your presentation however I to find this topic to be really something which I feel I would never understand. It kind of feels too complicated and extremely huge for me. I’m looking forward for your subsequent put up, I will try to get the cling of it! Thanks for some other excellent post. The place else may anyone get that type of info in such an ideal way of writing? I have a presentation subsequent week, and I am at the search for such info. Heya i’m for the primary time here. I found this board and I in finding It truly helpful & it helped me out much. Wonderful web site. Plenty of useful information here. I am sending it to some buddies ans also sharing in delicious. And obviously, thank you to your effort! I would suggest it to anyone looking for a boost! Just desire to say your article is as amazing. The clearness in your post is simply excellent and i could assume you’re an expert on this subject. Fine with your permission allow me to grab your RSS feed to keep updated with forthcoming post. Thanks a million and please carry on the rewarding work. Hi there, just become aware of your weblog thru Google, and located that it’s truly informative. I am going to watch out for brussels. I will appreciate should you proceed this in future. Numerous other folks will probably be benefited from your writing. Cheers! Have you ever thought about writing an ebook or guest authoring on other blogs? I have a blog centered on the same ideas you discuss and would love to have you share some stories/information. I know my viewers would appreciate your work. If you are even remotely interested, feel free to shoot me an e-mail. Wonderful site. Lots of helpful information here. Iâ€™m sending it to several pals ans also sharing in delicious. And of course, thank you on your effort! Hello there, I found your web site by means of Google even as looking for a similar topic, your site got here up, it appears good. I’ve bookmarked it in my google bookmarks. Hello there, I found your website via Google at the same time as looking for a related subject, your website came up, it appears good. I have bookmarked it in my google bookmarks. Definitely, what a great site and revealing posts, I definitely will bookmark your blog.Best Regards! I¡¦ve been exploring for a little bit for any high-quality articles or blog posts in this kind of house . Exploring in Yahoo I ultimately stumbled upon this website. Studying this info So i¡¦m satisfied to convey that I’ve an incredibly just right uncanny feeling I found out just what I needed. I so much indubitably will make sure to do not put out of your mind this web site and give it a look regularly. Thanks for sharing excellent informations. Your site is very cool. I’m impressed by the details that you¡¦ve on this blog. It reveals how nicely you perceive this subject. Bookmarked this website page, will come back for extra articles. You, my pal, ROCK! I found simply the information I already searched everywhere and just couldn’t come across. What a perfect web site. Great ¡V I should certainly pronounce, impressed with your web site. I had no trouble navigating through all tabs as well as related info ended up being truly easy to do to access. I recently found what I hoped for before you know it at all. Quite unusual. Is likely to appreciate it for those who add forums or anything, website theme . a tones way for your customer to communicate. Nice task..
whoah this blog is magnificent i really like reading your posts. Stay up the great paintings! You understand, a lot of people are hunting round for this information, you can help them greatly. Hiya, I am really glad I have found this info. Today bloggers publish just about gossips and internet and this is actually frustrating. A good site with exciting content, this is what I need. Thanks for keeping this web-site, I will be visiting it. Do you do newsletters? Can’t find it. mind this web site and provides it a glance on a relentless basis. Simply want to say your article is aas surprising. ffeed to keep up to date with imminent post. Thank you one million andd please keep up the rewarding work. Hi there! Someone in my Myspace group shared this website with us so I came to check it out. I’m definitely loving the information. I’m bookmarking and will be tweeting this to my followers! Terrific blog and wonderful design. I am really inspired with your writing skills and also with the layout on your weblog. Hey There. I discovered your blog the use of msn. This is a really smartly written article. I will make sure to bookmark it and return to learn more of your helpful information. Thank you for the post. I will definitely return. you have a terrific weblog right here! would you wish to make some invite posts on my blog? Thanks , I have just been searching for information approximately this subject for a while and yours is the greatest I’ve found out so far. However, what in regards to the conclusion? Are you certain about the supply? Magnificent goods from you, man. I’ve understand your stuff previous to and you are just too fantastic. I really like what you have acquired here, really like what you are stating and the way in which you say it. You make it entertaining and you still take care of to keep it wise. I cant wait to read much more from you. This is really a wonderful web site. Thanks , I’ve recently been looking for information about this subject for a long time and yours is the best I have discovered till now. But, what about the conclusion? Are you certain concerning the supply? Pretty nice post. I simply stumbled upon your weblog and wanted to say that I’ve really enjoyed browsing your weblog posts. In any case I will be subscribing on your feed and I am hoping you write again soon! Hey there, You have done an incredible job. I will certainly digg it and for my part recommend to my friends. Yet another thing is that when looking for a good online electronics retail outlet, look for online shops that are consistently updated, always keeping up-to-date with the most current products, the perfect deals, in addition to helpful information on goods and services. This will ensure you are handling a shop that stays over the competition and provide you what you should need to make intelligent, well-informed electronics acquisitions. Thanks for the essential tips I have learned from your blog. F*ckinâ€™ tremendous issues here. I am very glad to see your article. Thank you a lot and i am looking ahead to touch you. Will you kindly drop me a e-mail? to running a blog but I do write in my diary every day. Spend an evening in the desert of Dubai on a thrilling safari! Go 4WD dune bashing, see a desert sunset, take a camel ride, enjoy live entertainment, and feast on a barbecue buffet dinner in a friendly Bedouin camp.